Stormwater - Fitzgerald Environmental Associates LLC. 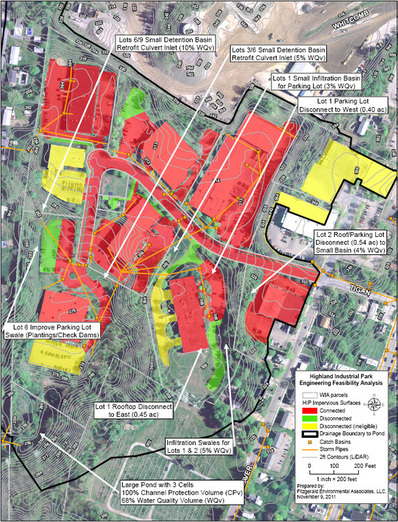 Fitzgerald Environmental, in collaboration with sub-consultant EcoSolutions, LLC., was retained by the City of Winooski to provide stormwater planning, design and permitting services for a 34 acre, 10 lot Industrial Park in Winooski, Vermont. 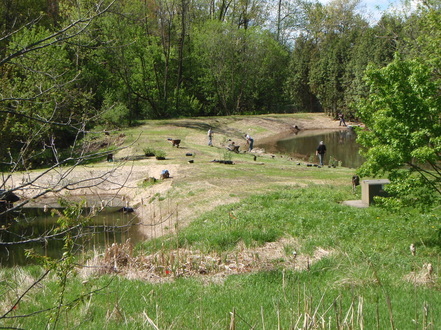 The Park represents 20% of the Morehouse Brook watershed, and is a high-priority mitigation site to address biological impairment in the downstream channel. The site evaluation included a review of lot plans, incorporation of these plans into GIS, and field verification of man-made drainage features. Five (5) LID stormwater practices (e.g., rooftop disconnects and bioretention systems) were designed and implemented at the lot-scale, and a large stormwater treatment system was designed, permitted per VTANR and USACE requirements, and constructed at the downgradient site which receives the Park’s entire runoff. The large stormwater system features three (3) free-water surface wetlands and wet ponds in series to maximize treatment of the water quality volume and channel protection volume from the site. The stormwater projects were successfully constructed in 2012 with oversight from FEA and EcoSolutions. Between 2009 and 2012, the City of South Burlington constructed four large stormwater ponds to treat runoff from the Butler Farms/Oak Creek Village (BFOCV) neighborhood. These ponds are designed to intercept and treat runoff from the neighborhood that was historically piped directly to Tributary 7 of Potash Brook. Other practices implemented in the neighborhood in recent years include installation of rain barrels, construction of rain gardens at private homes, and the construction of a riparian floodplain area along the channel. Before these practices were implemented, discharge and water quality data were collected in Tributary 7 of Potash Brook over a six year period (2004-2005 and 2007-2009). In 2013 the City contracted with Fitzgerald Environmental Associates (and sub-consultant Stone Environmental) to quantify the effect of the treatment practices on peak flows and pollutant transport at the neighborhood-scale. The FEA team installed two flow and water quality monitoring stations to evaluate stormwater runoff quantity and quality from the neighborhood, using a paired watershed design. The FEA team successfully monitored all 14 storm events occurring in the monitoring period. The inflow and outflow in two stormwater treatment ponds draining to Tributary 7 of Potash Brook were also monitored for three storm events. In early 2013, the City of South Burlington (CSB) Department of Public Works sought to develop city-wide estimates of stormwater runoff volumes and pollutant loads for the period from 2003 to 2012. The CSB Stormwater Utility has been upgrading under-performing stormwater best management practices (BMPs) and installing new BMPs throughout the City since 2005. The purpose of this analysis was to: 1) estimate runoff volumes and pollutant loads at the City-scale since the inception of the SWU; 2) estimate how the treatment provided by the BMPs maintained by CSB compares with the volumes and loads at the City-scale; and 3) track SWU progress in treating stormwater over time. CSB DPW hired Fitzgerald Environmental Associates (FEA) to develop the methods and data to address these questions. Due to the complexity of estimating peak flow rates in multiple subwatersheds in CSB, FEA developed a volumetric-based approach for estimating stormwater treatment and pollutant load removal. The final spreadsheet and GIS database were designed to allow for simple annual updates to track progress as new stormwater treatment systems are constructed.